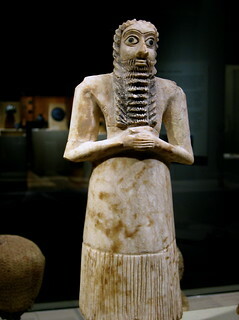 Standing male worshiper, 2750-2600 B.C. In Mesopotamia gods were thought to be physically present in the materials and experiences of daily life. Enlil, considered the most powerful Mesopotamian god during most of the third millennium B.C., was a "raging storm" or "wild bull," while the goddess Inanna reappeared in different guises as the morning and evening star. Deities literally inhabited their cult statues after they had been animated by the proper rituals, and fragments of worn statues were preserved within the walls of the temple. This standing figure, with clasped hands and a wide-eyed gaze, is a worshiper. It was placed in the "Square Temple" at Tell Asmar, perhaps dedicated to the god Abu, in order to pray perpetually on behalf of the person it represented. For humans equally were considered to be physically present in their statues. Similar statues were sometimes inscribed with the names of rulers and their families.